Strength of the WAVES . The WAVES were created in 1942 and their personnel strength increased rapidly throughout the year. As of July 1943, some 27,000 officers and enlisted women were on duty in the naval service, but nearly 10,000 were still undergoing training in various programs. Shortly before the end of World War II, in early August 1945, the WAVES reached their peak strength. At that time, the WAVES were comprised of 8,000 female officers and 78,000 enlisted women on active duty. WAVES Petty Officers .. This number represented 18 percent of all naval personnel assigned to shore establishments in the stateside United States, being based in over 900 stations and bases directly serving the fleet and forward bases throughout the Pacific. This large number of WAVES effectively released over 50,500 male sailors for duty either aboard ships or in other forward positions overseas. In addition to this achievement, the WAVES became responsible for nearly 27,000 other newly created jobs.
. The wartime performance of the WAVES had been so successful that the Navy was reluctant to give up the program, which had been planned as an experimental war-emergency measure. Therefore, although the Navy rapidly demobilized and returned to peacetime strength, a small nucleus of officer and enlisted women were retained on active duty. On March 27, 1946, the Navy suggested that Congress consider making their retention permanent, by authorizing the enlistment and appointment of women in the regular Navy and in the Naval Reserve. By that time, the number of WAVES on active duty had been reduced to 9,800 female personnel. 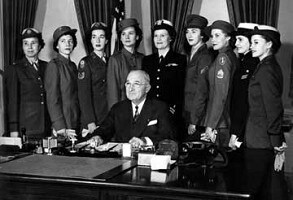 Legislation to integrate women into the permanent Navy structure was introduced in 1946 and passed by the Senate on July 23, 1947. However, Congress adjourned before final action on the bill was taken. The number of WAVES continued to diminish and the active ranks of women were reduced to only 2,300 personnel by January 1948. For the first time, WAVES could now be appointed and enlisted in the Regular Navy and Naval Reserve. This meant that the former “Women's Reserve” was eliminated, and all female officers and enlisted women were transferred to corresponding components of the Regular Navy and Naval Reserve. The law also set an authorized strength of women in the Regular Navy (two percent of the total Navy enlisted strength). The number of authorized female commissioned and warrant officers was set at ten percent of the number of enlisted women in the Navy. The law also set a limit of 500 officers, 20 warrant officers and 6,000 enlisted women for two years. The law also provided the same pay, leave conditions, monetary allowances, and other benefits accorded Navy male personnel for women serving in the Navy. .vv The Navy began implementing the new WAVES program on June 13, 1948, when it authorized the enlistment of women reservists in the Regular Navy. 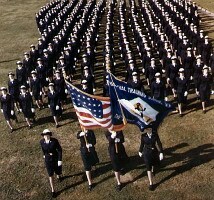 Shortly thereafter, on 7 July, 1948, the first group of enlisted women was sworn into the Regular Navy, which marked a real milestone of naval acceptance. On October 15, the first WAVE officers were also sworn into the Regular Navy. That September, the Navy began recruiting enlisted women again, and these first recruits reported to training at Great Lakes, Illinois, during the next month. In December, the first class of newly commissioned female officers accepted from civilian status was sent to the new WAVES General Line School at Newport, Rhode Island. 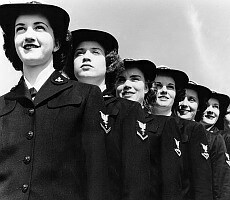 During 1949, women were again serving important roles throughout the Navy. Some WAVES were posted overseas, and even saw duty with the Navy contingent of the Berlin Airlift (despite dangerous conditions flying over Soviet-held territory into the beleaguered former German capital). By the end of July 1949, there were 3,216 WAVES serving on active duty within the Navy. .